Not as impressive as in Brazil or even Bolivia, but there are some villages where it can be really nice and colorful. 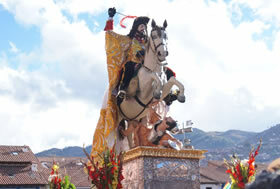 In Cusco itself throwing water is the main ingredient of the festivities. 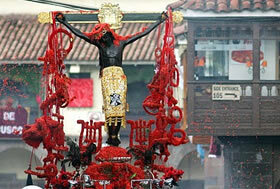 Full of processions, bands, flowers and big religious images. 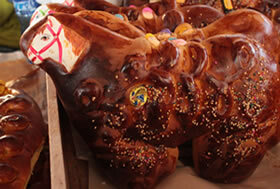 A whole week, starting with Palm Sunday and Senor de los Milagros the week before Eastern Friday. This is one of the most intriguing and authentic Festivals of the Cusco area, celebrated high up in the Peruvian mountains close to the Ausangate, a couple of hours busdrive and another couple of hours of hiking from Cusco city. Not many tourist participate in this pelgrimage to celebrate the Lord of the Snow Star. An almost unique event. 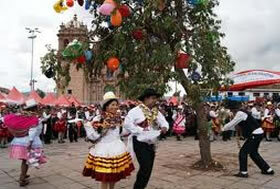 The festival of Corpus Christi in Cusco is an annual celebration which has continued tradition since Colonial times. 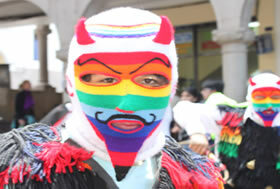 This festival is one of the most important religious festivals in Peru. The procession starts in the Plaza de Armas of Cusco on the 60th day after Easter Sunday with a parade of Saints and Virgins. Eight days after the principal day, they do it all over again, when all the Saints need to go back to their own churches. 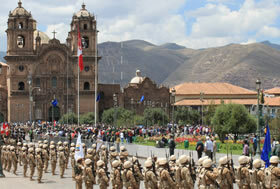 Also called The Day of Cusco, the most important Festival in Cusco. 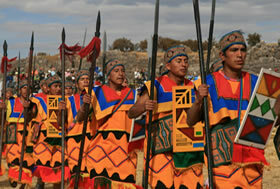 The impressive ceremony is a celebration to el Inti, the Sun God and sees a brightly coloured entourage of people. The first part is celebration downtown, and around 11.00 all the people go up to the ruins of Sacsahuamana. If you want t VIP seat you have to pay for it but you can also hang out there and see bits and pieces if it all for free. All Saints Day, o Dia de los vivos/ dia de los muertos is when Peruvians remember and honor their death relatives and friends by going to the cementries with a nice and big meal. Like many other Catholic celebrations in Latin America, this is a ‘mixture’ of the old Spanish All Saints Day existing indigenous festivities to meld the "new" Catholicism with the "old" pagan beliefs. Christmas in Peru is celebrated as anywhere in the world, with the Christman (Papa Noel), postcards covered with snow and many gifts. 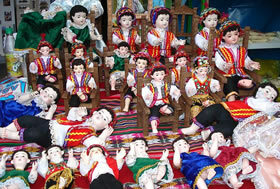 The week before Christmas there is a tradicional Christmas Markt, a local, Andean version of the Christmas markets you might know. Worth a visit.